A 50 y old male patient consulted our hospital for intermittent satiety for more than 6 months, who had no symptoms such like acid regurgitation, anepithymia, epigastralgia, nausea, vomiting, fever or melena, however, it could be relieved by domperidone or rabeprazole. There was no significant weight loss during the last 6 months. The patient has experienced appendectomy 10 y ago and not addicted to alcohol or tobacco. One month ago, the patient got worse symptoms of epigastric satiety with eructation, which could not be remitted by symptomatic treatment. Result of gastroscope inspection in local hospital showed an ulcer in antral wall, malignant change cannot be excluded. After the patient was admitted in our hospital, the CT scan of abdomen was performed, which revealed that irregular thickening of the antrum wall and multiple enlarged lymph nodes, tending to a malignant ulcer. The first gastric biopsy showed that numerous lymphoproliferation and a few atypical cells in lamina propria of gastric mucosa. To make a clear diagnosis, second gastric biopsy was performed and the results revealed that atypical cells infiltrating in antral mucosa. Considering the both results of imaging test and pathological tentative diagnosis, the patient was diagnosed with advanced gastric carcinoma and received gastrectomy of stomach neoplasms (distal gastrectomy/D2/ Billroth's I). One pyloric lymph node of 1.2 cm diameter was examined by rapid pathological examination during the operation, which was highly suspected to be Hodgkin lymphoma. After operation, the lymph node was processed with conventional pathological examination. The lymph node destruction and focal interstitial fibrosis could be found under microscope, but there was no fiber strips around nodules. There were neutrophils, plasmocyte and ehistiocyte-like-cells in the background under the microscope. Large cells with distinct nucleolus were dispersedly distributed. Typical RS cells could be found (Figure 1). Immunohisto-chemical examination showed CD15 (+), CD20 (-), CD3 (-), CD30 (Ki-1) (+), CD79α (-), EMA (-), PAX-5 (partial large cell +). 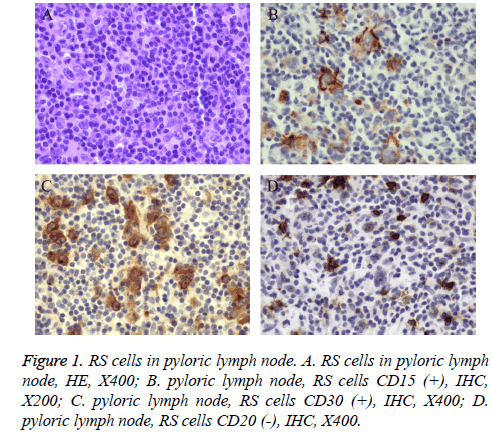 Figure 1: RS cells in pyloric lymph node. A. RS cells in pyloric lymph node, HE, X400; B. pyloric lymph node, RS cells CD15 (+), IHC, X200; C. pyloric lymph node, RS cells CD30 (+), IHC, X400; D. pyloric lymph node, RS cells CD20 (-), IHC, X400. The pathological examination of gastrectomy specimen showed that there was an area of thick gastric duplicature about 6 × 7 cm in gastric antrum, resembles gyrus shape and the thickness of gastric wall was about 0.9 cm. Twenty-two and 12 lymph nodes were detected in lesser curvature and greater curvature respectively. Microscopically, medium to large lymphoid cells infiltrated diffusely in mucous layer and submucosa of lesser curvature and the background was composed of small lymphocytes and large cells with distinct nucleolus. Multinucleated cells could be found occasionally (Figure 2A). Lympho epithelial lesions could be found in mucosal surfaces. One of these 34 lymph nodes was involved. Immunohistochemical examination showed CD20 (++), CD15 (-), CD30 (++), CD3 (-), Mum-1 (scattered+), CD79α (++), BCL-6 (-), BCL-2 (-), CD10 (-), Ki-67 index (90%) (Figures 2B-2F). 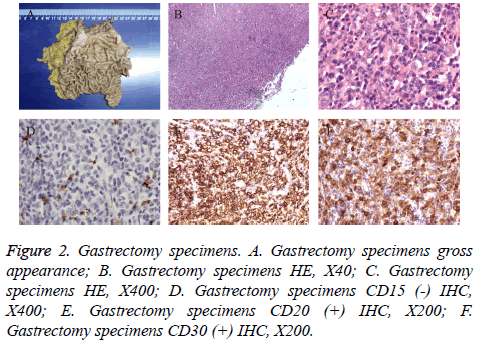 The final pathological examination showed that in gastric antrum, there was Diffuse Large B-Cell Lymphoma (DLBCL), non-germinal center B-cell like subtype, poorly differentiated. However, in gastric pylorus it was mixed with cellularity Hodgkin Lymphoma (MCHL). Figure 2: Gastrectomy specimens. A. Gastrectomy specimens gross appearance; B. Gastrectomy specimens HE, X40; C. Gastrectomy specimens HE, X400; D. Gastrectomy specimens CD15 (-) IHC, X400; E. Gastrectomy specimens CD20 (+) IHC, X200; F. Gastrectomy specimens CD30 (+) IHC, X200. The patient recovered well after the operation and was discharged in 7 d. The bone marrow biopsy and bone marrow smear were performed 1 month later. No enlarged superficial or deep lymph node was found by physical examination, ultrasonography or CT scan. No tumor cells were found in cerebrospinal fluid. These results indicated that the tumor was primary. The patient received R-CHOP therapy in our hematology department for 8 courses and was in stable condition by 1 y following up. Most human lymphomas were consistency. They could occur in different sites simultaneously. Non-Hodgkin’s Lymphomas (NHL) are a heterogeneous group of lymphoproliferative malignancies that are much less predictable than Hodgkin’s and have a far greater predilection to disseminate to extranodal tissues . In the head and neck region, NHL has been observed in the Waldeyer’s ring, oral mucosa, salivary glands, paranasal sinuses, laryngeal tissue, and osseous structures . The pathological type is generally identical and will not change during the development and progression of disease. However, few patients suffered two or more different types of lymphomas, simultaneously or successively, even in the same lymph node. Composite Lymphoma (CL) was defined as those two different types of lymphoma occurred in the same anatomic site or tumor. And discordant lymphoma (DL) occurred with different types in different sites . Both CL and DL were rare. According to the above classification, the patient in our case report, who was DLBCL of stomach combined with MCHL of pyloric lymph node, supposed to be DL. DLBCL is a kind of tumor composed of large B-lymphoid cells. 25-30% adult non-Hodgkin lymphomas in Western countries are DLBCL, morbidity in some developing countries is even higher. The median patient age of DLBCL is 70 y old, meaning that mainly occurs in elderly patients. The morbidity is slightly higher in males. The etiology of DLBCL is not clear so far, and underlying immunodeficiency is one of the important risk factors. Generally, DLBCL is primary, but also could be secondary sometimes as the progression and transformation of indolent lymphoma, such as follicular lymphoma, marginal zone lymphoma and nodular lymphocytepredominant Hodgkin lymphoma . Gastrointestinal tract is the most common location of extranodal lymphoma. There are plenty of morphological changes and more than 10 histologic subtypes of DLBCL, characterized by medium to large cells and diffusely infiltrating. DLBCL has 2 cell origins, germinal center and activated B lymphocyte, according to gene modification, IHC characteristics and prognosis of patients. The former has better prognosis. The case in our report was primary DLBCL of stomach originating from activated B lymphocyte with anaplasia, and partial cells express CD30 but CD15. MCHL is a subtype of CHL, characterized by typical RS cells with the background of granulomas composed of diffused or clustered small lymphocytes, plasmocytes, eosinophilic granulocytes and histocytes, no incrassation of lymph node capsule, fibers encircled nodular or wide fibroplasia . Typical diagnostic RS cells are common. MCHL accounts for approximately 20~25% of classical Hodgkin lymphoma. Median age of the patients is 37 y old and 70% patients are male. B symptom is the most common clinical manifestation of MCHL. Lymph nodes involved is common, 30% patients are associated with spleen involvement . Mediastinum and other parts of the body are rarely affected. Consequently it is more rarely that only pyloric lymph nodes were involved signally in this case. In this case, the middle-aged male patient got initial symptoms of satiety. Gastric antrum resembles hypertrophic gastropathy, large B-cells infiltrated diffusely with poorly-differentiated area microscopically. IHC results indicated B-cells source, which supported the diagnosis of stomach Diffuse Large BCell Lymphoma (DLBCL). It was completely different with gastric lesions that pyloric lymph node was found with large cells dispersedly distributed in complex background cells partially in accord with typical RS cells of Hodgkin lymphoma. Immunohistochemical examination showed that pyloric lymph node lesion was different from gastric lesion with CD15 (+), CD30 (Ki-1) (+), CD20 (-), which supported the diagnosis of Hodgkin lymphoma. The examination one month after operation excluded the possibility that lesions of stomach and pyloric lymph node were secondary tumors, meaning that they were both primary. Beside the classic DLBCL morphology, there is less differentiated area in this stomach lymphoma case. In addition, several exceptional multinuclear cells arouse our attention. They were similar to popcorn cells of MCHL, CD15 (-), which were considered possibly as transformational large lymphoid cells but not HRS cells. Hence, whether there might be a link between MCHL and DLBCL still remain to be confirmed. It is reported that the relationship of two types of lymphoma in composite or discordant Hodgkin lymphoma and non-Hodgkin lymphoma was complicated. The two lymphomas were independent lesions. The posterior lymphoma was supposed to be the transformation of anterior one, which meant that they were clone-related lesions . The two lymphomas were clone-related lesions and with the same precursor cell, but they had their own typical gene mutations . Greiner et al. demonstrated that most of composite HL and B cell lymphoma were clone-related using microdissection and PCR detecting of Immune globulin (Ig) or T-cell receptors gene V region. Typical gene mutations were detected in the Immune globulin (Ig) gene V region of both composite HL and B cell lymphoma, which suggested that Hodgkin lymphoma and B cell lymphoma might be originated from the same precursor cell that highly possible is follicular germinal center B cell and progress to two different lymphomas individually. Briiuninger et al. has reported 6 composite Hodgkin lymphomas and T-cell lymphomas, of which 2 cases were cloned origin, while the other 4 cases were not. In this case, morphologies and immunophenotypes of the two lymphomas were inconsistent, and no more molecular detections were performed. Considering all above, clonerelated lesions cannot be excluded in this case. It has been reported that marginal zone B-cell lymphoma of the Mucosa- Associated Lymphoid Tissue (MALT) turns into DLBCL; Hodgkin lymphoma turns into DLBCL after therapy . Therefore, the patient received R-CHOP (Cyclophosphamide +Adriamycin+Vincristine+Prednisone+Rituximab) therapy for 3 courses instead of ABVD therapy, and is still in stable condition so far by following up for 1 y. In conclusion, we report a case of discordant lymphomas composing simultaneous gastric diffuse large B-cell lymphoma and mixed cellularity Hodgkin Lymphoma in stomach. It reminds us to focus on the different lesions which involved lymph nodes in gastrointestinal lymphomas. Immunohistochemistry is contributed to the diagnosis. Moreover, whether the appendectomy patient received 10 y ago was related to multiple different lymphomas is not clear and need to research further more. This study is supported by Weifang science and technology development projects (NO.201002200) and the Key program of Shandong province research and development (NO. 2015GSF118168). Many thanks to Xiaoge Zhou, Department of Pathology, Beijing Friendship Hospital. Kolokotronis A, Konstantinou N, Christakis I, Papadimitriou P, Matiakis A, Zaraboukas T, Antoniades D. Localized B-cell non- Hodgkins lymphoma of oral cavity and maxillofacial region: a clinical study. Oral Surg Oral Med Oral Pathol Oral Radiol Endod 2005; 99: 303-310. Ikeda T, Kanaya T, Matsuda A, Motohashi K, Tanaka H, Kohno N, Kamiya S, Fujioka Y, Kobayashi R, Mizuno F, Hasegawa M. Clinicopathologic study of non-Hodgkin lymphoma in sinonasal and hard palate regions in 15 Japanese cases. Orl J Otorhinolaryngol Relat Spec 2005; 7: 23-29. Muller-Hermelink HK, Zettl A, Pfeifer W, Ott G. Pathology of lymphoma progression. Histopathology 2001; 38: 285-306. Sklar J, Cleary ML, Thielemans K, Gralow J, Warnke R, Levy R. Biclonal B-cell lymphoma. N Engl J Med 1984; 311: 20-27. Ansell SM. Hodgkin lymphoma: diagnosis and treatment. Mayo Clin Proc 2015; 90: 1574-1583. Vannata B, Zucca E. Primary extranodal B-cell lymphoma: current concepts and treatment strategies. Chin Clin Oncol 2015; 4: 10. Jiang W, Li GD, Li L, Tang Y, He YM. Clonal relationship between transformed and non-transformed components in mUCOS8-associated lymphoid tissue lymphoma. Chinese J Pathol 2007; 36: 736-741. Campo E, Swerdlow SH, Harris NL, Pileri S, Stein H, Jaffe ES. The 2008 WHO classification of lymphoid neoplasms and beyond: evolving concepts and practical applications. Blood 2016; 127: 2375-2390. Greiner TC, Gascoyne RD, Anderson ME, Kingma DW, Adomat SA, Said J, Jaffe ES. Nodular lymphocyte- predominant Hodgkin 7 S disease associated with large cell lymphoma: analysis of Ig gene rearrangements by V-J polymerase chain reaction. Blood 1996; 88: 657-666. Brauninger A, Schmitz R, Bechtel D, Renne C, Hansmann ML, Kuppers R. Molecular biology of Hodgkins and Reed/Sternberg cells in Hodgkins lymphoma. Int J Cancer 2006; 118: 1853-1861. Van den Brand M, van der Velden WJ, Diets IJ, Ector GI, de Haan AF, Stevens WB, Hebeda KM, Groenen PJ, van Krieken HJ. Clinical features of patients with nodal marginal zone lymphoma compared to follicular lymphoma: similar presentation, but differences in prognostic factors and rate of transformation. Leuk Lymphoma 2016; 57: 1649-1656.